There's a lot more to Iceland than ice and vikings. Discover Iceland's fascinating history on a walk around Reykjavik, which includes a visit to the massive Lutheran church of Hallgrimskirkja. Drive along the island’s spectacular South Shore past the Reynisdrangar Rocks and volcanic black sand beaches. It’s currently low season in Iceland. Prices are good, and Iceland's attractions aren’t crowded. Discover Iceland's fascinating history of Reykjavik, and visit the astonishing Lutheran church of Hallgrimskirkja. Sleep in a local guesthouse in the eastern fjords region..
Marvel at the largest ice cap in Europe..
Gape at the Jökulsárlón Glacier Lagoon with seals floating on icebergs..
Look for sunbathing seals at the Jökulsárlón Glacier Lagoon..
Marvel at the Great Geysir..
A chance to see the Northern Lights in amazing landscapes. Complete the Golden Triangle of Gullfoss Waterfall, Geysir and Thingvellir N.P. Glacier walking and the amazing Glacial Lagoon. Reykjanes Peninsula: Hot springs, mountains, bird cliffs, light houses and fishing villages. Blue Lagoon: Relaxing in a natural geothermal spa surrounded by a lava field.. Discover the best of what South Iceland has to offer. Witness the magical Northern lights while relaxing in a rooftop hot tub. Experience the atmosphere at Midgard Base Camp. Explore Iceland's glaciers and waterfalls..
Keep your eyes peeled for dazzling displays of the Northern Lights..
Soak your muscles in natural hot springs..
See every side of Iceland on the Ring Road. Discover the stunning Golden Circle. Hike on glaciers and go whale watching. 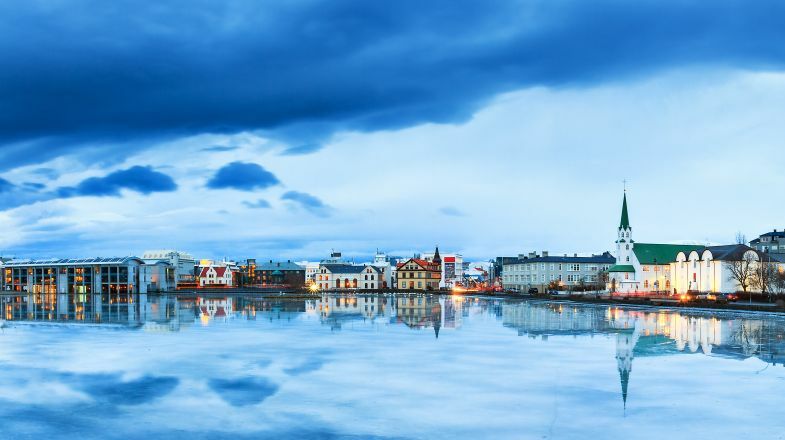 A panoramic view of Reykjavik, the capital of Iceland. A trip to Iceland is a rare treat. The country has only seen an influx of tourism in the last 15 years or so. As airlines create new routes to the capital city of Reykjavik, the country is building new infrastructure to keep up with the crowds of adventurers rushing to take in all the Nordic island has to offer, especially active holidays and outdoor tours, revealing mother nature at her best! Iceland’s beauty is unrivalled, hosting every natural wonder you could possibly imagine: cascading waterfalls, gushing geysers, impressive glaciers, and volcanic lakes. The country is paradise for any nature lover. Want to see absolutely everything Iceland’s 100,000 square kilometres have to offer? Iceland has no trains and few public buses. Renting a car allows you to make spontaneous stops at hot springs or to take selfies with roadside Icelandic horses. The Blue Lagoon is most easily visited on your way to or from the airport using a bus transfer that departs every hour. Pack water-resistant clothing and be prepared to dress in layers. It’s key for handling Iceland’s unpredictable weather and controlling your body’s temperature when climbing about waterfalls and glaciers. Get ready to expand your taste pallet. Iceland is known for its skyr, an extremely thick high-protein yoghurt, and specialities like smoked puffin, reindeer, and whale meat. Visiting in the summer months? Be prepared for constant daylight. Be sure to pack an eye mask for blocking out the light when sleeping. Iceland has seasonal weather so please do check up on the best time to visit Iceland before planning your tour. And if you’re still hunting for more things to do and places to explore in Iceland, do check out our Iceland Travel Guide for more information.